And just like that it is game time here in Seattle between the New York Yankees and the Seattle Mariners. 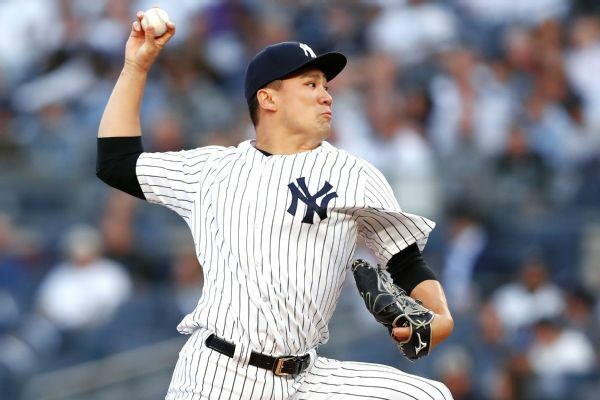 In the first of three between these two clubs this weekend the Yankees will send Masahiro Tanaka to the mound to face off with James Paxton for the Mariners. The game will be played at 10:10 pm ET inside Safeco Field and can be seen on the YES Network. You can also follow along with the game on MLB TV, with the MLB At-Bat app and by tuning into the Yankees radio broadcast on WFAN with John Sterling and Suzyn Waldman. Follow us on Twitter, @GreedyStripes, and “Like” us on Facebook, The Greedy Pinstripes, to keep up with us and the Yankees all season long. Enjoy the game, even on the weekend I am too old to stay up and watch the entire game… I’m sorry… and go Yankees!! What happened to Heche-VAHR-ia? That lasted about 2 games.